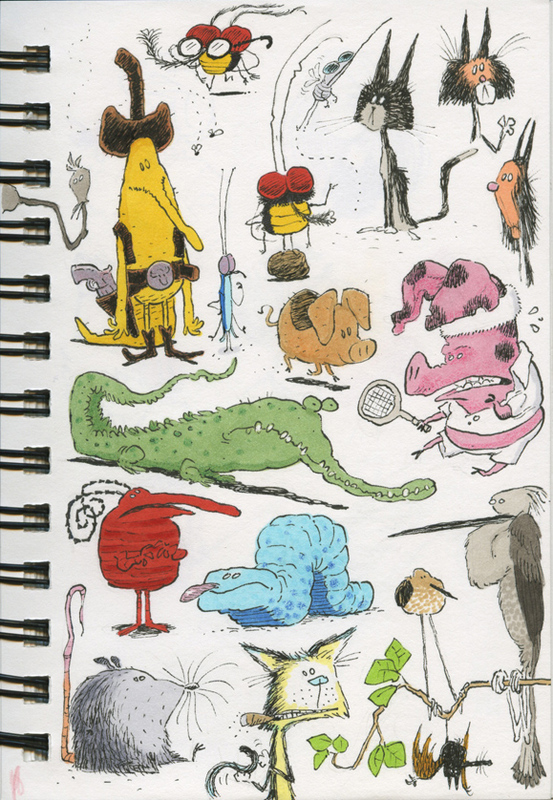 Most of my sketchbook pages are horribly ugly experimentations, but this one actually has some cartoony appeal so I thought I'd share. Micron pens and copic markers. Hey Mark - I love it!! Totally nice designs:) I really like the birds on the branch! 2 years old and already a Buzz fan!? That's great. I always thought of myself as more of a Woody kinda guy... reach for the sky! You've probably seen Tod since he's back in town. I'll have to make it out there someday. Nice to hear from you Susanne! Kathyrn, Alex, thanks so much! Very cool Mark! Such cool designs. Love your animation as well. I always watch your "4 PM" short for inspiration. Wish I could've had you for a mentor last term for class 6. Anyway, all the best! Anh, I checked out your blog. I like the animal sketches. Nice reel too! Congrats on finishing AM! Wow! Thanks for dropping by my blog. I'm honored. And thanks for the compliments. Once I get my reel finalize, I'll post it up for you. I'm trying to get back to my 2D training. Wish I could've used it professionally. Thanks for the encouragement. Have a wonderful weekend and I look forward to seeing more of your sketches. Great Jon Stewart caricature! Love that guy. Hi Mark! I'm finally "done" with my reel. Here it is. Thanks for checking it out. Have a great week! Nice stuff Anh. Quite a full and well rounded reel. I especially like the dog shot. Good luck with it!